Chocolate Walnut Cake with Sprinkles for BundtBakers. 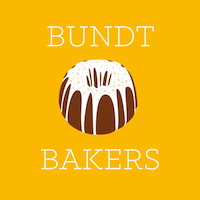 I have been a member of BundtBakers for a while now and never before got organised enough to have a post typed up and ready to go in time for each months different theme. This chocolate walnut cake is a cake for when you are craving chocolate, there is melted chocolate and cocoa in the batter and melted chocolate in the icing. One Friday I was walking home from work and it was pouring with rain. We had a friend coming over for dinner the next day and it was her belated birthday dinner. I had spent all week going backwards and forwards about what cake to make or tray bake or brownies as I still had some left over Strawberry ice-cream and really wanted to use it up. Enter this Chocolate walnut cake. I loosely followed a recipe in 150 cake recipes, but decided that I didn’t have the right size pan (do you ever find that when you are looking for a cake tin, you wish you had labelled the cake tin when you got it so you knew which size it was?) and felt that I wanted more than what the original recipe made. So, the Bundt chocolate and walnut cake was born. With the addition of sprinkles, because, who really doesn’t like sprinkles? A very big thank you to Terri of Love and Confections for setting this month’s theme and organising it. I have seen how much work goes into it, so I doff my virtual cap to you Terri. This wonderful intense chocolate cake is topped with popping candy sprinkles for that extra element of surprise. Preheat the oven to 160 degrees without the fan. Grease your bundt tin and set aside. Place the eggs and castor sugar in a bowl and beat with an electric mixer for 10 minutes, you can use either a handheld whisk or stand mixer. You will know that it is ready when it has almost doubled in size and it leaves a trail across the mixture when dragged across the surface. Set aside. Melt the chocolate in a heatproof bowl set over a pot of simmering water, ensure the bottom of the bowl doesn’t touch the water otherwise your chocolate will burn. Once it has melted, remove from the heat and set aside. Sift the flour, baking powder, cocoa powder over the egg mixture and fold into the mixture with a large spoon. Fold in the melted butter, walnuts and the melted chocolate. Mix gently until it is all well combined. Spoon the batter into your greased bundt tin and spread around so that the mixture is evenly spread around. Place on the middle of the oven and bake for 40 minutes. To check if the cake is ready insert a wooden skewer into the middle of the cake and it it comes out clean, it is ready, otherwise bake for another 5 minutes. When ready, remove from the oven and place on a wire rack for ten minutes to allow to cool slightly. After 10 minutes invert the bundt tin over the wire rack and gently tap the top so that the cake drops out onto the wire rack, set aside and allow to cool completely. Once the cake has cooled completely, make the frosting. To make the frosting, melt the chocolate and leave it to cool slightly, the best way to do this is melt the chocolate, then remove from the heat whilst you beat the icing and butter together. Beat the softened butter, icing sugar and milk until combined and pale (to ensure that there are no puffs of icing sugar all over the kitchen cover the hand held mixer and bowl with a clean dish towel and mix on the lowest setting) the cloud of icing sugar will be contained under the tea towel and so you don’t make a big mess. Once combined, add the melted chocolate and gold glimmer crunch and mix well with your hand mixer until throughly combined and a nice chocolate colour. Use a palette knife, spook or large knife and frost the top of the cake. Be generous and slather a thick layer over the top of the cake be generous as the icing is delicious. Once all used up and covered in a thick layer of frosting, sprinkle your popping candy sprinkles all over the top and store in an air tight container until ready to eat. So there you have it, my Chocolate Walnut Cake with Sprinkles for Bundt Bakers – this cake is wonderful, moist and would be huge hit at any party, be they adult or child. Enjoy and do let me know what you think in the comments below. This entry was posted	on Thursday, August 20th, 2015 at 8:00 am	and is filed under All Cuisine, Cakes, Picnic. You can follow any responses to this entry through the RSS 2.0 feed. You can leave a response, or trackback from your own site.